4 bedroom 3 bath end unit townhouse in Freeport Village. Townhouse has a 1 car garage, additional parking for one car and a full unfinished basement. Walking distances to all shops, restaurants and event areas in historic downtown Freeport, Maine. Main level offers open concept kitchen/living/dining with hardwood floors and 9 ft. ceilings. 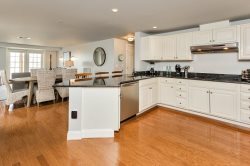 The custom kitchen features cherry cabinets, stainless steel appliances, granite counter tops, spacious walk-in pantry and sliding doors to outside deck with gas grill. The dining area offers seating for 8 and kitchen offers bar seating for 2. The living area features L-shaped couch with great relaxing and entertaining space and a desk area.